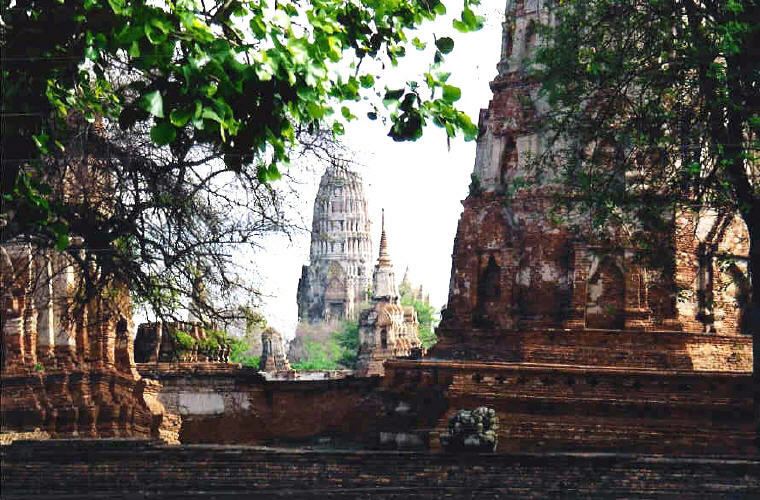 With its shapely chedis and picturesque pagodas, the ancient city of Ayutthaya has always been a big draw for tourists seeking a taste of the Orient. It not only offers scenic views and a rich history, it is also the spiritual heart of the nation to the Thai people and home to the kingdom’s greatest treasures. The styles of art and architecture in this ancient city can be seen in the temples, murals and buildings all over Thailand. 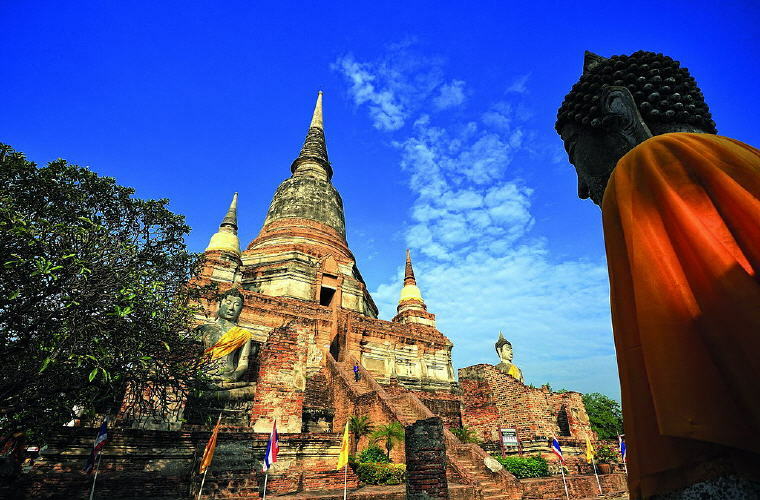 Thus by spending time in Ayutthaya, the historical heart of Thailand, visitors can make a real connection with the past and have a better understanding of Thainess. 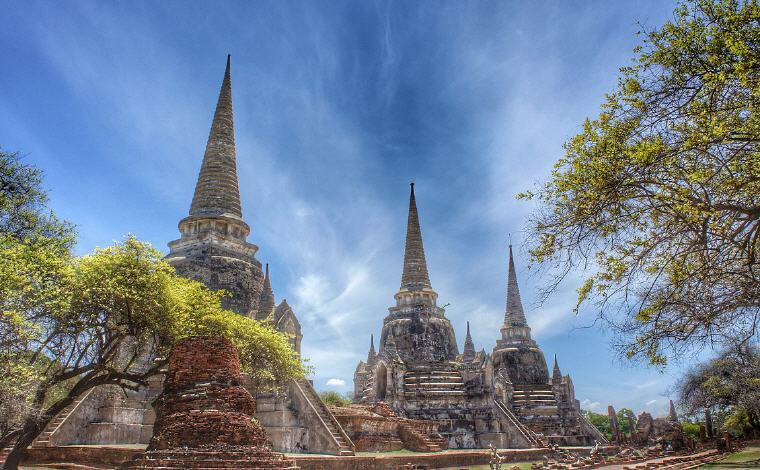 Founded in 1350, Ayutthaya was the second major capital of Siam (after Sukhothai). During its most glorious period from the 14th to the 18th centuries, it was considered one of the largest and most beautiful cities in the world. The city was a centre of diplomacy and commerce, attracting traders from both Asia and Europe seeking luxury goods and Thai rice. 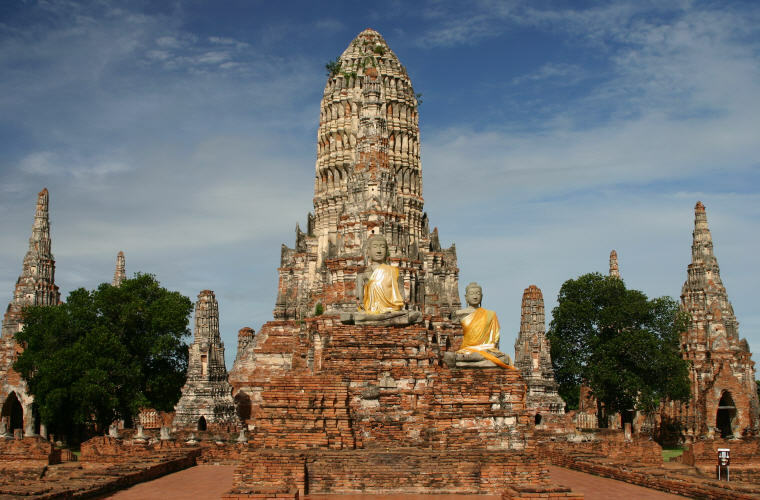 Ayutthaya flourished thanks to its strategic position on an island surrounded by three rivers that connected it to the Gulf of Thailand. 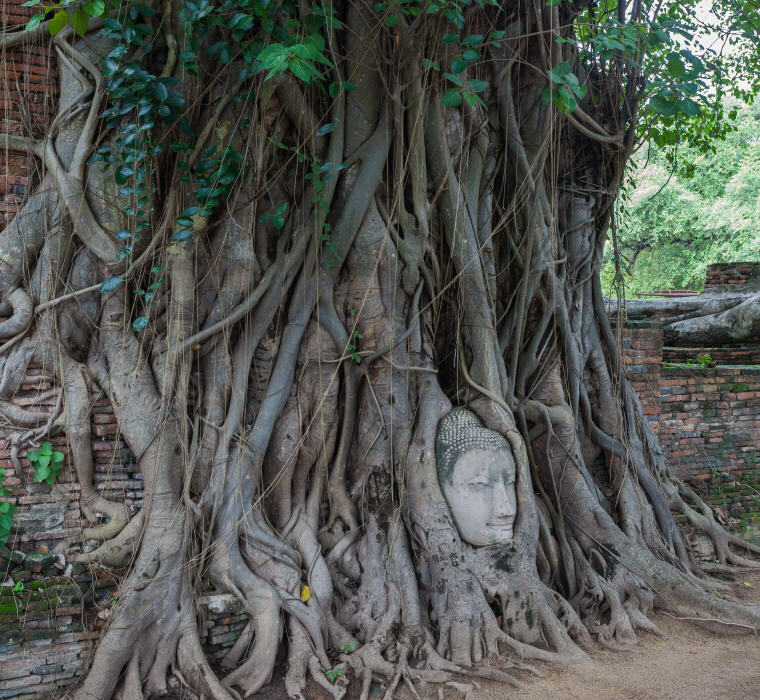 To this day, Ayutthaya remains one of the first attractions beyond Bangkok visited by tourists. Just a short distance from Bangkok, it makes a popular destination for a day-trip; visiting the many temples and monuments, and enjoying some of the famous local food before heading back to Bangkok. The Wat Yai Chai Mongkhon is one of the most popular and best preserved of Ayutthaya’s temples in the southeast of the ancient city. You can climb the steep steps from the base of the temple’s 62-metre chedi for an outstanding views of the city. It was built by King U-thong in 1357 A.D. for the use of the monks who had returned from Ceylon after studying under Phra Vanarat Maha Thera. This is one of the best known temples in the Ayutthaya Historical Park and was one of the Royal temples where Ayutthaya’s kings carried out ceremonies. Large and imposing, the temple is in the Khmer style and the central prang is 35-metres high and represents the mythical Mount Meru. If you look carefully in the corner galleries, there are still traces of the original carved ceiling pieces. One of Thailand’s best loved monarchs, King Naresuan the Great (1555 –1605) helped to free Ayutthaya from the Burmese, who held it as a vassal state. The huge reverence in which he is held can be seen from the monument dedicated to him at Ayutthaya. 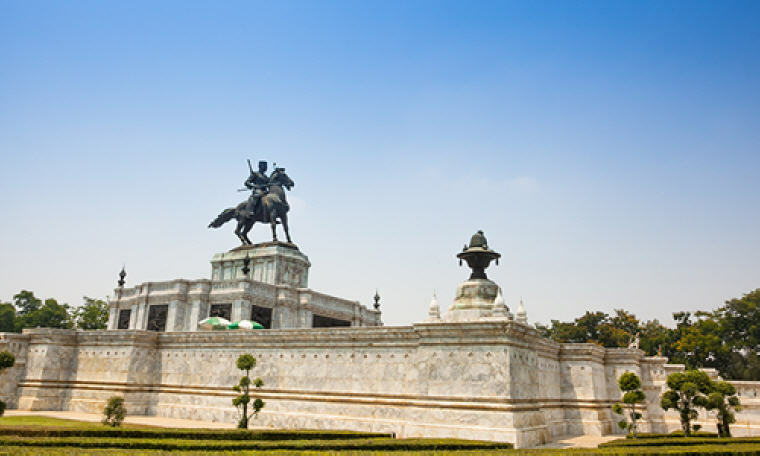 A statue shows him astride a horse riding on a decorated base showing achievements from his life, including an impressive image of the king wrestling a crocodile. The monument is next to Chedi Phukhao Thong, an impressive 50-metre structure you can climb to enjoy the views. Perhaps the biggest and grandest of Ayutthaya’s temples, but Wat Phra Sri Sanphet is certainly the most important in antiquity. It used to be within the grounds of the Royal Palace and so was only used by members of the Royal Family. Wat Phra Sri Sanphet suffered a great deal of damage after the fall of Ayutthaya in 1767. However, its beauty was so legendary that it served as the model for the glorious Temple of the Emerald Buddha in Bangkok. 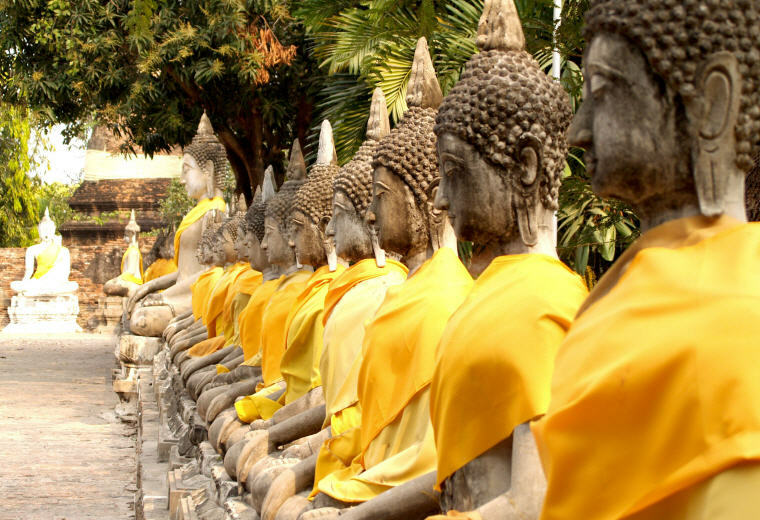 Many tourists come to Ayutthaya with one aim, to get a photo of what has become the city’s most famous Buddha image. 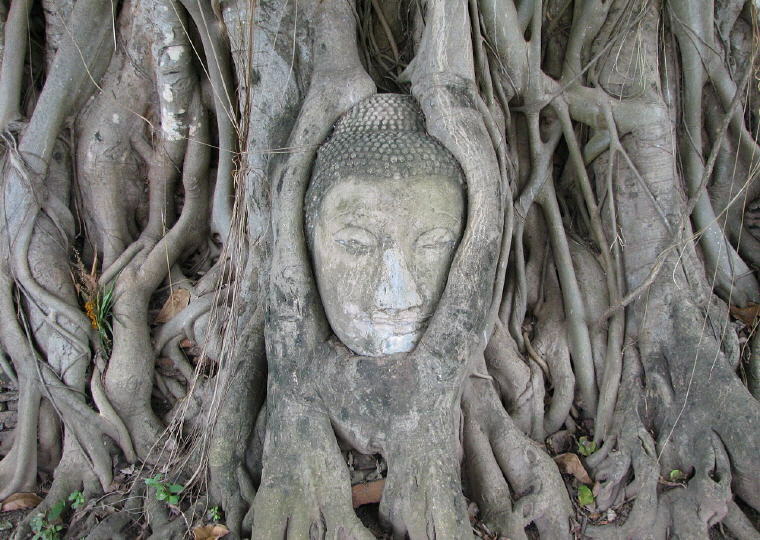 This is the elegantly carved Buddha head, which has become a living part of the landscape. But it’s well worth taking a longer look around Wat Maha That, as it is one of the city’s most important temples and the oldest, being started around 1374. Look carefully and you’ll find the remains of centuries-old murals. All the temples have something worth stopping by for. One of the best restored of Ayutthaya’s temples is Wat Thammikarat, which has lovely sculptures of ancient lions and naga’s as well as a reconstruction of the huge Buddha head that was found there. If you appreciate over-sized statues, you need to visit Wat Phanan Choeng, which predates even the founding of the city itself. 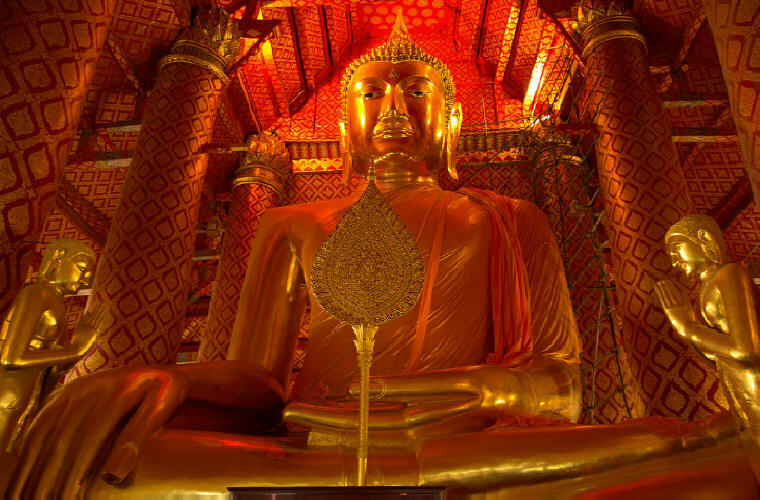 The temple houses a huge seated Buddha, said to date from 1334, though it has been restored several times. 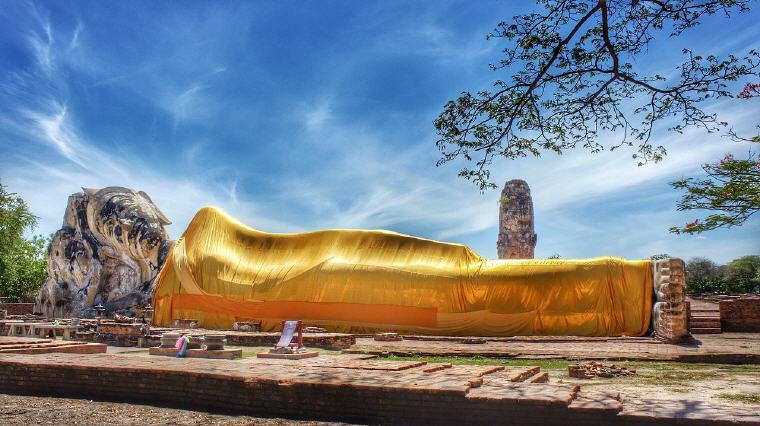 The Buddha statue is nearly 20 metres tall and known as Luangpho Tho. Wat Phanan Choeng is seen as important to sailors and was visited by the famous Chinese Admiral, Zheng He in 1407 on one of his voyages of exploration. There are many temples and ruins of ancient sculptures all over Ayutthaya and it would take several days to see them all. But you can avoid being templed-out by taking breaks and enjoying some of the other treats on offer. There are always friendly vendors around selling hearty bowls of noodles, cool drinks or refreshing fruit; riverside restaurants offer tempting spots to have lunch. 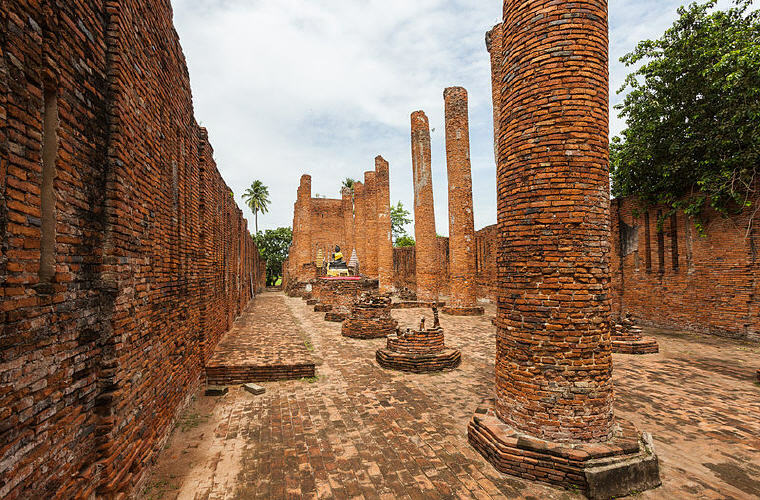 No matter how you choose to see this ancient city, you’ll come away with a better understanding of what makes the Thai people so proud of their heritage. • By Train: The cheapest way of getting to Ayutthaya is by train from Bangkok’s Hualamphong Railway Station. There are regular trains and the trip takes about two hours. • By Minibus: Mini buses leave for Ayutthaya from Bangkok’s Victory Monument area every half hour or so. The operators are based around the Century Plaza cinema complex. • By Car: Take Highway No.1 (Phahon Yothin) and go via Pratu Nam Phra In. This takes you to Highway No.32, then, turn left on to Highway No.309 to Phra Nakhon Si Ayutthaya. Going on foot is not really practical unless you just want to see the central temples. There are many places that rent out bicycles. As the landscape is relatively flat, it’s not hard to cycle around. Remember to put on sunscreen and a hat. Another option is to rent a tuk-tuk or minivan for a few hours, as some of the temples are further apart.